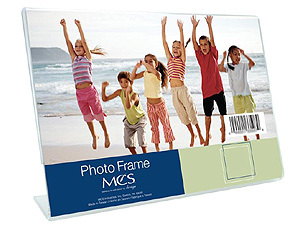 Simple and popular single 8x12 horizontal style acrylic picture frame is of one piece construction and ideal for displaying pictures on a desk or tabletop. This simple and popular single 8" x 12" horizontal style acrylic picture frame is of one piece construction and ideal for displaying pictures on a desk or tabletop. This inexpensive yet sturdy 2mm plastic frame also makes a great sign holder.